Presentation: Type B2 thymoma is usually seen in adults in their 5th or 6th decade of life. Almost 55% of patients present with myasthenia gravis (muscle weakness, fatigue, diplopia, drooping eyelids, and dysphagia). Others have symptoms related to compression of anterior mediastinal structures (dyspnea, cough, chest pain) and fever, night sweats, and weight loss. Some are asymptomatic. About 5% of patients have pure red cell aplasia, hypogammaglobulinemia or other autoimmune disorders. Type B2 thymomas are more likely to invade beyond capsule into the surrounding fat or mediastinal structures as compared to thymomas type A, type AB, or type B1. Only about 32% of type B2 thymomas present in Stage I (completely encapsulated grossly and microscopically) as compared to 50% of cases for type B1 thymoma. 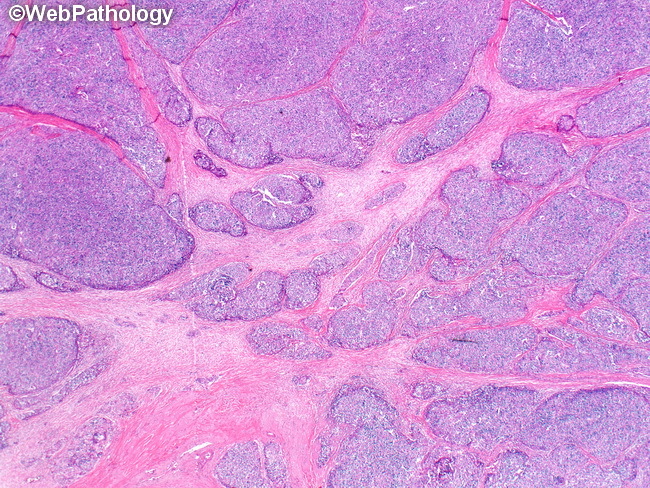 This low magnification view shows fibrous septa dividing the tumor into irregularly shaped lobules.